This book includes assessment tools and language intervention resources that can be used to develop instructional programs for children or adults with severe communication disorders. The materials are designed primarily for children or adults who are functioning below the five-year level in their development of basic communication skills. The resource will be especially valuable to speech-language pathologists and special education teachers who provide instructional services for students with developmental disabilities, autism, hearing impairments, or severe attention deficits. 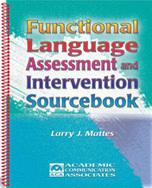 The book includes developmental checklists, an assessment checklist for autism, short criterion-referenced vocabulary measures, and a variety of informal language assessment tools that can be helpful in identifying specific problems in vocabulary, sentence structure, or the pragmatic uses of language. Criterion-referenced vocabulary measures can be used to assess basic vocabulary skills in English or Spanish. The resources in this book will be helpful in developing instructional objectives for individual students and in monitoring progress. All of the record forms may be reproduced. A CD that includes all of the reproducible record forms from the manual is available as an optional item. The CD makes it easty to print out the assessment record forms whenever you need them.